Every villain needs a calling card. You know, something that the Gotham City Police Department can remember them by! After all, what’s the point of getting away with a fabulous crime if no one knows that you were the one who committed it? Well, this is an art that Batman’s greatest foe, The Joker, has mastered. He leaves a simple playing card at the scene of his crimes. When he robs a bank or gets away with some kind of diamond heist, the cops know right away that it was him by his playing card. Now, you can have your own calling card when you dress up like The Joker! The Joker Playing Card set comes from the visionary Batman film, The Dark Knight. It comes with a full deck of 52 playing cards, so even if you decide not to use them as calling cards, you can just play a game of gin rummy. Each card has a clown theme on it and various cards have crude writing on them, almost as if The Joker has already marked them! The back has a Dark Knight theme on them, making them a great collectible as well as a great accessory for a Joker costume. 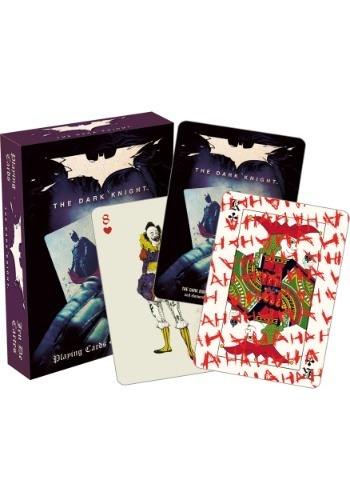 So, whether you just want to have some cards on you to play a quick game of solitaire, or you need a new calling card, these Dark Knight Joker cards are the perfect accessory!